This water bottle can help you guard your home or office with no fuss. 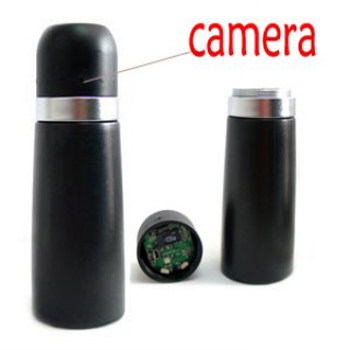 With a 5 million CMOS camera parameter, this spy camera captures the view of your home with a 180 degree angle. This water bottle automatically begins recording video with 1280*720 resolution at 30 frames per second as soon as someone enters its recording area. If there is nothing to record, then the camera will go into standby mode to save power. This stylish spy camera can also take 2560x1920 pixel photos for users to upload directly to their PC. With 512MB memory capacity, this water bottle can record for several minutes. You can plug a TF memory card (up to 8GB) into it if you want to record longer. It can be charged by being plugged into a PC via the included USB cable. The camera can record constantly for 2 hours after being fully charged. Memory expansion: up to 8GB.